On a canvas of sand. As I walked the narrow strip of sandy beach, I began to notice some of the individual clumps of seaweed and pebbles that the ocean had deposited on the shore. Such beautiful colours. Such interesting shapes. I stopped to photograph one. But, before I could release the shutter, a wave washed over the scene and completely changed it. The artistic swirls and lines that I’d seen were now just a messy jumble. I moved on, and tried to work more quickly. Another wave, another scene. Sometimes I was fast enough, sometimes not. Sometimes the subject disappeared entirely into the receding foam. Even the scenes further up from the ocean would eventually be claimed by the tide. For the next little while, I combed the beach. 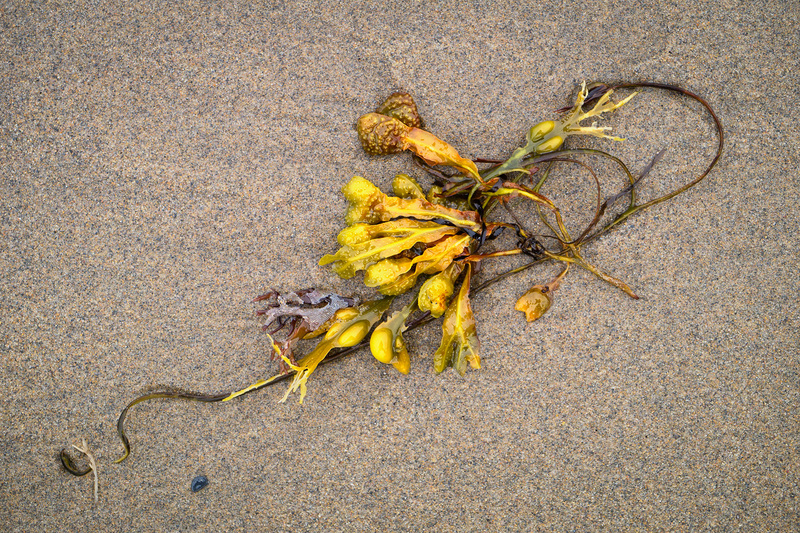 I was struck by a thought – how many of these unique little vignettes of ocean life have been created and destroyed with every tide, or every wave, on all the beaches of all the seas, and across all of time? I felt like a curator, forced to make instant decisions about which canvases to choose from the infinite number that were presented. And knowing that the ones not chosen would never be available again. Normally, I’m a slow and deliberate photographer; this was a very different way of working for me. There was a sense of excitement and urgency, and I barely noticed when my shoes filled with seawater. I felt very much alive. Very powerful, John. And excellent image.